Bantwal, July 07, 2018: The residents of Sajipamunnur and RSS activists have constructed a memorial on the spot where RSS activist Sharath Madiwala was laid to rest, on July 7, 2017. RSS activist Sharath Madiwala succumbed to the injuries he suffered following an attack, last year. Sharath Madiwala was running a laundry in B C Road. 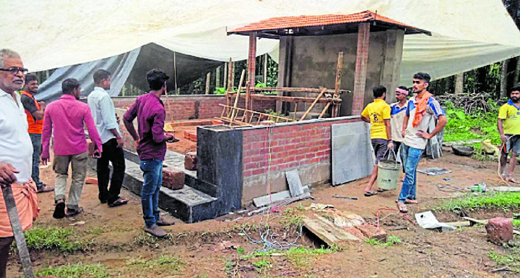 Taniyappa Madiwala, father of Sharath, said that he agreed to requests and pressure by his son’s friends and villagers to allow them to construct a memorial. "Sharath’s memory continues to haunt me. The reason for his murder is not known. The police have failed to bring out the truth behind his murder,” he said. Granite has been used for constructing the memorial. Even a roof has been laid. The photo of Bharath Mathe and Sharath Madiwala in Yoga posture is kept in the memorial. Madiwala was a Yoga expert. He used to teach Yoga to youth and children at Nandavara Temple premises daily. After completing Yoga, he would return home to milk the cow, to supply milk to the dairy. It may be recalled that after stabbing incidents at Kalladka and Melkar, the police had imposed prohibitory order in Bantwal in June last year. On July 4 at around 9.20 pm, when Sharath was closing down the laundry, three miscreants came on a bike, attacked him with swords and fled the spot. Fruit vendor Rauf who saw him lying in a pool of blood along with local youth, rushed him to the hospital in Mangaluru. He was declared dead on July 6,2017 at 8.30 pm. When Sharath’s body was taken in a procession to B C Road on July 7, unidentified miscreants pelted stones which created tension in Bantwal. As a precautionary measure, ahead of first death anniversary of Sharath Madiwala, additional police personnel have been deployed in the region.